How do you stay up-to-date and lead in a complex and rapidly changing field? You utilize real world knowledge from the acknowledged experts. 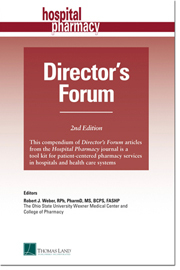 This new and expanded compilation of articles from the Hospital Pharmacy journal's highly acclaimed Director’s Forum column, the Director’s Forum book delivers unparalleled insight into the most effective approaches to the challenges you face. E-BOOK CUSTOMER NOTES: After you place an order for this e-book you will receive an e-mail containing a URL and code for downloading the file. The format of the Director's Fourm 2nd edition e-book is epub. It is the most common e-book format. This e-book file has been tested in iBooks for Apple devices, and Calibre for PC devices. There are numerous free e-book readers available. Your IT department may have one that they prefer. There is also a free e-book reader available from Adobe.